Evocative Irish songs of wit, love and humor featuring Celtic Harp, flute, tin whistle, bodhran, mandolin, guitars and Irish pipes. Kathleen Donohoe, originally from Cavan, in the Republic of Ireland, is Atlanta's only authentic Irish music performer. 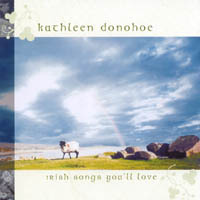 She moved to Georgia in 1984, and carried with her a passion to share traditional Irish music with American audiences. Having grown up in a large renowned musical family, she has been entertaining since a very young age. Kathleen has sung as a U.S. finalist in World/All-Ireland traditional Irish singing competitions. Her repertoire includes traditional ballads, lively 'pub' songs, love songs, songs in the Irish language and songs that evoke a picturesque Ireland. She is self accompanied on guitar or drum, and performs solo, or with Celtic harper Debra Peterson, and other local musicians. Kathleen is available for bookings for parties, festivals, wedding and wakes at ceolcait@bellsouth.net or 404 314 6671. Since moving to Georgia, Kathleen has been featured at the High Museum of Atlanta, The Margaret Mitchell house, Fado Irish pub (in Buckhead, where she performs most Monday evenings), and other venues in South Carolina, Chicago and New York. She recently served on the board of Ireland in Dixie - 2007, Atlanta's largest festival of Irish Music, song and dance. Debra Peterson is a native of southern Illinois. She has a B.S. Music degree, and plays Celtic Harp (which towers over Kathleen on stage! ), flute, tin whistle and vocal harmonies. She performs regularly at the Atlanta's Shakespeare Theatre and the Georgia Renaissance Festival. Debra has released her own CD, "Harp in Ivy", which includes some of her own compositions, along with other Turlough O'Carolan tunes for Harp, and many classic Celtic melodies. Debra is truly credited for having built her own harp from a kit. Great collection of Irish songs by some talented artists! This CD is a collection of Irish tunes that are not familiar to me but each song is very clever. The songs are very uplifting. Kathleen and Debra are quite talented artists. I got this thinking it would be a CD that I might listen to sometimes...well, was I wrong! I listen to it ALL the time. It is something that you can sing with comfortably. Sounds like songs sung around the piano after dinner. Superb!! I am really hoping more of her work comes out!